Invisible, gravity load connectors designed to eliminate aesthetically undesirable corbels, haunches, ledges or daps for clean, elegant connections between beams, staircases, slabs, double tees, and other precast/prestressed concrete structures. The TSS and RVK are hidden gravity connections for precast stairs and landings. Both are telescopic solutions where the unit is cast into the precast concrete and when erected, an inner tube is pulled out to fit in a receiving pocket in a support wall or beam. The design methodology for the TSS & RVK are identical with the TSS being completely hidden in the concrete and not exposed at the surface like the RVK, making it an ideal solution for conditions where the precast surface is exposed. In 1994, JVI was approached by PARTEK (now SPENNCON CORP.), a Norwegian firm, to market and sell the BSF framing connection system & the RVK stair connection. These two hidden connections offer clean streamlined aesthetics by eliminating unsightly corbels or ledges. These are valuable tools in helping the architect choose precast over cast-in-place. Consideration for the use of these products can be best accommodated early in the design phase of a project. Cord operated, sliding inner. 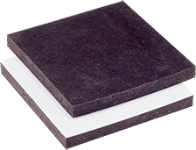 No visible markings on landing top surface – ideal for landings without screed toppings. Operated by a bolt mechanism from above landing. Cost-effective, rugged solution ideal for screeded landings. The intent of these guidelines is to allow TSS & RVK Connector users to benefit from its full, tested capacities. Testing results for the RVK models. Note: These results also serve as validation for the TSS models (TSS101G and TSS41G) with performance being equivalent. These tests were performed on the RVK 100 & 40 models. The results also serve as validation for the TSS models (TSS101G and TSS41G) with performance being equivalent. The anchorage of the reinforcement is the deciding factor for the load carrying capacity of the RVK-units. The tests have revealed that it is relevant to establish a minimum slab thickness in order to utilize the full capacity of the RVK100-unit. Altered reinforcement pattern in 200 mm slabs (test series B) did improve the load carrying capacity. The low failure load in test A1 is probably due to the short distance from the corners and the shape of the reinforcement. If test A1 is disregarded, the mean failure load for test series A is 98,9 kN; the standard deviation is 8,9 kN; and the characteristic load is 76,6 kN. This is still less than the characteristic load for test series B (92,4 kN). The results from test series B do not support of the hypothesis that the units closest to the corners have reduced capacity, while the results in test series A and C indicates that the hypothesis is correct. The altered arrangement of the reinforcement in test series B may be the reason. For safety reasons it is considered prudent to establish a minimum distance from the RVK-unit to the corner of the slab. For the slabs of 265 mm depth, the mean failure load for test series C is 141,1 kN, and the characteristic failure load is 108,9 kN when all results are considered. The tests where the support was on two units have a lower mean failure load of 130,6 kN, but the characteristic failure load is 122,2 kN. This is due to the small scatter in the last case. With a large number of tests it can be assumed that the characteristic failure load would be about the average of the results of the two samples of the population used above. This is due to a smaller value for w, and without any increase in the scatter the standard deviation will be smaller. The average characteristic failure load is (108,9 + 122,2) / 2 = 115 kN. (A documentation of this assumption is on page 11, where it is shown that the characteristic failure load of all the tests on 200 mm slabs is 77,1 kN. This is close to the average results of test series A and B = (58,3 + 92,4) / 2 = 75,4 kN. Consequently the “material factor”, defined as the ratio of characteristic failure load and the design ultimate load, will be 115 / 100 = 1,15. This is considered satisfactory. The maximum service limit state load will be about 100 / 1,4 = 70 kN. Examining the condition of the test specimens at this load level reveals that the crack development at this stage is insignificant. The corresponding service limit state load is about 80 / 1,4 = 57 kN. Examining the condition of the test specimens (except tests A1 and A2) at this load level reveals that the crack development at this stage is insignificant. Download full test results and details above. .SAT – 3D model saved in Spatial’s ACIS solid modeling format; stores three-dimensional geometry information in a standard text file format; used for exchanging 3D data between multiple systems and is supported by many 3D CAD programs that include Spatial’s 3D ACIS Modeler component. .STEP – A STEP file is a 3D model file formatted in STEP (Standard for the Exchange of Product Data), an ISO standard exchange format. It contains three-dimensional data in a format that can be recognized by multiple programs. .DWG – A DWG file is a database of 2D or 3D drawings created with AutoCAD, a professional CAD program. It contains vector image data and metadata that describes the contents of the file. DWG files are related to .DXF files, which are ASCII versions of DWG files. .RFA (REVIT) – Data file that can be loaded into a project created with Revit, a building information modeling (BIM) program; contains one or more 3D models that can be imported into a 3D scene; may be created and saved using the Revit Family Editor. .SLDPRT (StuctureWorks) – A SLDPRT file is a 3D image format used by SolidWorks CAD software. It contains a 3D object or “part” that may be combined with other parts into a single assembly (.SLDASM) file. The ShooterTM is an invisible, gravity connection designed to eliminate the need for aesthetically undesirable corbels, haunches, or daps when building a precast/prestressed concrete structure incorporating double tees. The ShooterTM is an invisible, gravity connection designed to eliminate the need for aesthetically undesirable corbels, haunches, or daps when building a precast/prestressed concrete structure incorporating double tees. More specifically, it is a tube within a tube which is cast into the ends of the double tee stems at their widest point. The inner tube is recessed during casting and extended at erection into a receiving pocket in a spandrel, wall, or beam. Full scale test results have indicated that the ShooterTM has a mechanical design strength in excess of 40,000 lbs. The intent of these guidelines is to allow Shooter Connector users to benefit from its full, tested capacities. Mechanical strength details for the Shooter Connector. Full scale test results have indicated that the Shooter has a mechanical design Strength in excess of 40,000 lbs. The testing also indicated that a strut-and-tie model can be used to design any member using the shooter as a connection. To achieve the mechanical design capacity of the Shooter sufficient concrete must surround the shooter to develop the required compression strut capacity and reinforcing must be supplied to develop the required tension strut capacity. Test of the JVI Shooter in Double-Tee Beams. In December 2008 four tests were performed on the beam to spandrel connection referred to as a shooter. Two different shooters were tested, a 40 kip capacity shooter and a 50 kip capacity shooter. For each size shooter, two different reinforcing steel designs were investigated. The two design methods are referred to as the Jason and the Norway design methods. A double‐tee, 20 ft in length and 10 ft in width was tested. Each stem of the double‐tee contained one of the shooter and cage designs. Each test performed had the same set up. The double‐tee was set up such that three stems were supported on neoprene pads, and the tested stem was supported by the shooter. An actuator was placed 6 ft away from the face of the double‐tee, using a load cell to measure the force applied to the beam. Another load cell was placed under the extended arm of the shooter to measure the force carried by the connection. There were also three wire pots set up to measure deflections of the beam. One wire pot was set up under the applied load while two others were set up near the face of the double‐tee, one under the stem and the other on the flange of the beam. This was done to make sure there was no separation between the connection and the concrete during testing. Prior to casting of the double‐tee, strain gages were placed on the rebar cages to determine how the bars were being engaged during testing. The purpose of the tests was to ensure that the shooter capacity was at least achieved and that the rebar cages designed were sufficient to carry this load. Failure of the system was measured when load in the shooter dropped suddenly. The following chart displays the results found after testing. Download full test results and details to the left. A hidden beam end connection for gravity loads that eliminates the need for projecting column corbels. The BSF connection is a hidden beam end connection for gravity loads that eliminates the need for projecting column corbels. It provides a simple, efficient connection that allows the designer new freedom in creating clean, elegant lines in the completed precast/prestressed concrete structure. The BSF connection can be used in all types of building structures where beams frame into columns, such as office buildings, hotels, parking structures, schools, sports stadiums, and other similar structures. In 1994, JVI was approached by PARTEK (now SPENNCON CORP.), a Norwegian firm, to market and sell the BSF framing connection system & the RVK stair connection. These two hidden connections offer clean streamlined aesthetics by eliminating unsightly corbels or ledges. These are valuable tools in helping the architect choose precast over cast-in-place. Obviously, consideration for the use of these products can be best accommodated early in the design phase of a project. The intent of these guidelines is to allow BSF Connector users to benefit from its full, tested capacities. Testing results for the BSF/BCC beam connector. Product development of the BSF connections involved two series of load tests. The original BSF connections were load tested by the Norwegian Building Research Institute, Oslo, Norway, in 1988. An internal truss calculation model for design of the force transfer from the steel box unit to the concrete beam was developed and experimentally documented through full-scale tests at SINTEF Structures and Concrete, Trondheim, Norway in 1992. Both series of load tests consisted of applying axial tension and vertical loads to concrete beams containing BSF end connections. The axial tension loads in the test were 40 to 50 percent of the vertical test loads, and represented shrinkage, creep and temperature contraction forces by sliding (friction) of the knife plate within the column box. The first series of 51 load tests, conducted in 1988, documented the capacity of the original BSF connection units. The internal truss calculation model was developed from the first test series, and verified in 14 additional load tests carried out in 1992. This test series included measuring strains in the reinforcement at about 20 points in each test specimen. Top plate replaced by half-round steel profile or “saddle” to provide direct contact with front hanger rebar steel. Use of a front plate flush with the end of the beam and welded to the beam box side plates and top half-round saddle. The bottom plate reduced in width to be the same as the beam box (side plates). The bottom plate in the smaller units is replaced by the longitudinal reinforcing bar anchoring the unit for axial tension loads. The simplified truss model for design was developed by Partek Ostspenn from the more rigorous theoretical models documented in the second load test series. The second load test series results showed the beam ends with BSF connections had greater ultimate capacity than predicted by this simplified truss model. The simplified truss calculation model neglects the additional strength contribution of: (1) the normal beam end shear reinforcement used around the BSF beam box unit; and (2) the cantilever moment capacity of the steel beam box and bottom longitudinal reinforcing bar welded to the beam box. Some of the SINTEF test results are presented in downloadable file to the left. The results indicate the maximum loads achieved during the tests easily exceeded the ultimate capacity calculated using the hanger rebar steel (Fig. 2, Force TF1) yield capacity and the ACI 318 Code concrete shear strength limits. Figures 3 and 4 show reinforcing arrangement, strain gage locations and crack pattern after fracture for test beams B4A and B7B. The ACI 318 Code limits nominal concrete beam shear stress to 10V¥Z, regardless of the amount of shear reinforcement, to conservatively control diagonal truss mechanism concrete stresses to a value below the crushing strength of the concrete. See more testing details in the downloadable document above.